"BPO@Escolta: A Dialogue Among Stakeholders"
First of all, please permit me – on behalf of the 20th Century Heritage Committee of the International Council on Monuments and Sites, or ICOMOS, Philippines - to thank the City of Manila for this opportunity to have this dialogue. Thank you also to the Manila Historical and Heritage Commission as well as to the Heritage Conservation Society of the Philippines. Thank you all for being here, at this meeting that was conceived very recently. Your presence here suggests that Escolta is valuable to all of us. The 470-meter stretch of street known as Escolta, though no longer literally at the heart of metropolitan Manila, remains at or near the crossroads of major institutions. Just across the Pasig River to the south are the universities of Intramuros, such as Mapua and Lyceum. A stone’s throw away is the University Belt, which includes institutions like FEU and the University of the East. A stronger throw away is the Mendiola Consortium which includes San Beda, Centro Escolar, and Holy Spirit. Near the northeastern end of Escolta, line 1 of the LRT runs on Avenida Rizal, which meets a few hundred meters north with line 2 of the LRT on Claro M. Recto. Escolta has been central to the history of this city for centuries. The architectural evolution of Escolta has demonstrated its importance as the country’s center of business. As a result of this, Escolta is at the heart of our country’s 20th century architectural heritage, particularly structures from before World War 2 and immediately after. What drew my particular attention recently was the opportunity to do research on Andres Luna de San Pedro, the architect son of the painter Juan Luna. He does not figure prominently in architectural discussions today, but he should. I am a modernist architect, but the things one can learn from an architect of his caliber are many. So the fact that two of his buildings – the Regina Building built in 1934 (with the fourth floor added later on by another Filipino architectural great, Fernando Ocampo) and the Perez Samanillo (now known as the First United Building), built in 1928 - face each other across the Escolta is a happenstance that – in light of so many demolitions that ravage this city – speaks of divine intervention. This struck me on a recent trip to Barcelona, on my first trip to Spain: to be impressed by the chamfered corners of Barcelona’s city blocks, and to enjoy them, and to somehow remember that I had witnessed such felicity somewhere else. I then remembered that I had seen this in Escolta. I mention this to indicate that memory is an important part of the human experience. I am not just talking of the architect’s experience. I am talking about the universal interweaving of observation with thought, emotion, and memory. I am talking about the confluence of elements that makes an experience of lasting impact. Such a confluence resides in Escolta, between Plaza Moraga and Plaza Santa Cruz, and hidden – not deeply, but still hidden – by Meralco wires and the indifference of a city. Aside from Andres Luna de San Pedro, we also have the Syvel’s Building, owned by the Puyats and possibly designed by the late National Artist for Architecture Juan Nakpil. To discover it is a rewarding experience, a post-war building being very contemporary but being very much informed by the proportions and harmonies of earlier Filipino architecture. The dialogue among buildings on this street – with the exception of the Metrobank tower – is an enriching experience for the observer. Of course I speak as an architect, but we architects, as part of our profession, observe things for you and learn things for you. This dialogue among buildings of different vintages, all done by the country’s greatest architects, is the kind of dialogue we all travel to other countries for. The visual stimuli intrigue us. You may not be conscious of exactly why it is that you travel, but still you travel. Another architectural master – Carlos Arguelles - gives us the former headquarters of Philippine National Bank. It is largely unused, and has actually been condemned. Let me just say something about condemning. It is the easiest thing in the world to do. Gossips do it all the time. But as in the case of a patient being advised to amputate his leg, it is always best to get a second opinion and a third. Science and technology today – as well as the more forward-thinking architecture – are able to stabilize the most endangered of structures. If any of you have seen the Atom Bomb Dome in Hiroshima, you will know what I am talking about. Almost beside the Philippine National Bank is the Capitol Theater by Juan Nakpil built in 1935, an Art Deco marvel built at around the same time as the Jai Alai Building on Taft Avenue. 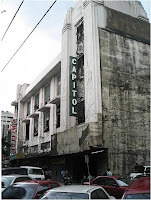 The story of the Capitol Theater is sad because the interior – a collaboration of Juan Nakpil, Victorio Edades, and Carlos Botong Francisco – is gone, carted away in a failed attempt to convert the theater into a restaurant. Some of you may believe as I do that to the last gasp there is life. And so this building has hope. Unlike the Jai Alai, which lost all hope when it was torn down. One of the finest Art Deco buildings in all of Asia, adaptive re-use could have transformed the Jai Alai courts into lecture halls or courtrooms. What we are doing today we do in honor of the Jai Alai. The Capitol Theater, in spite of its gutted interior, has the marvelous potential of being transformed into a building with a light-filled courtyard, to house a call center or other Business Process Outsourcing operations. The phenomenon that makes this possible is the Cloud. Mr. Junie Pama, Country Manager of InContact, will speak about it in detail later, but let me say that the Cloud brings hope to Escolta. The email you write is not necessarily saved in your laptop but in what is called the Cloud, literally the databanks of Yahoo or Google in Sunnyvale or Mountain View, California. Large warehouse-like office buildings are not necessary for call centers, which means that the moribund and architecturally significant structures of Escolta can be used for these new purposes. Escolta @ Heart, the title of this talk, refers to the emotional impact that a place has on a person. At the end of the day, that is what it is about. As an architect I strive each day to create the kind of spaces and experiences that have emotional impact. This is what is remembered. This is what you are after also: this creation of experience, this replication of authenticity. But why replicate when you can have what is real? Escolta has the quality of being original, of being close to where things started. This is a quality that cannot be replicated. As an architect, I would say that we do not build like we used to. It does not mean that we cannot, but just not yet, and we need Escolta to show us how. There is this idea of the Creative City as the ideal environment for the creation of new things. Escolta is at the heart of the idea of Manila as a creative city. We are speaking today about a vision of how BPO or Business Process Outsourcing can bring new life to the city, of how new software can bring new life to the hardware of this city. We are also expecting the transition from voice-based BPO, like call centers, to knowledge-based BPO, such as animation studios, design and engineering offices. Heritage structures are essential to the Creative City, because they are visually rich. Especially if they tell the story of a city and its people. We run to build new cities on rice field and forest in order to tell a story. But here in our midst is the story, told perhaps with torn pages, but still the story. The Creative City is at the heart of a creative country. If we are to remain competitive, then we must sustain what it is that enables us to be creative. Escolta has that environment: the architecture, the streets, the proximity to schools. The creative class needs the visual stimuli of the authentic, the emotional stimuli of the noble and meaningful. Here we have a street in a district beside a river, near the point where a city was founded. There is beauty here, and depth. There is much that needs to be removed to get to that beauty. But it is there, and when we reclaim it, the country will be reborn.